Welcome back everyone. Today is day #3 sneak peek of April release from Taylored Expressions. Tomorrow is the release day. Yay! Before that I have two more cards to share using the new products. 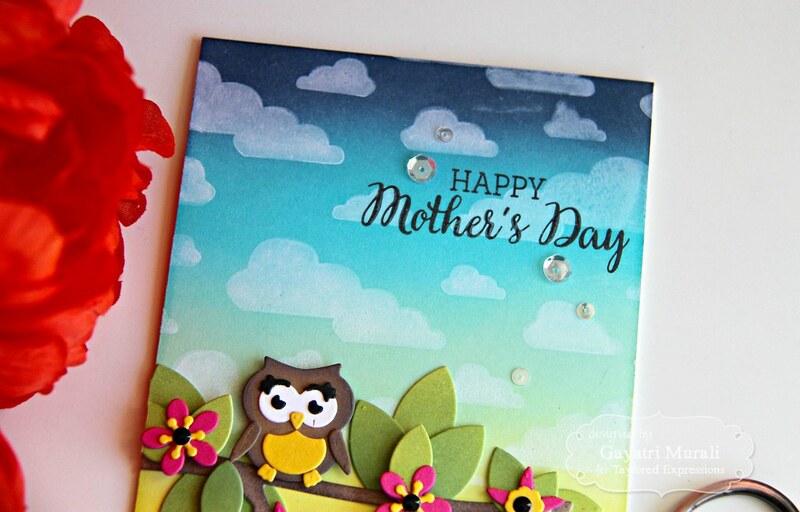 First up I am showcasing a new die called Little Bits : Owl. This owl is so cute and coordinates very well with On a Limb: Branch and On a Limb: Leaves dies. I have used all three of them on my card. 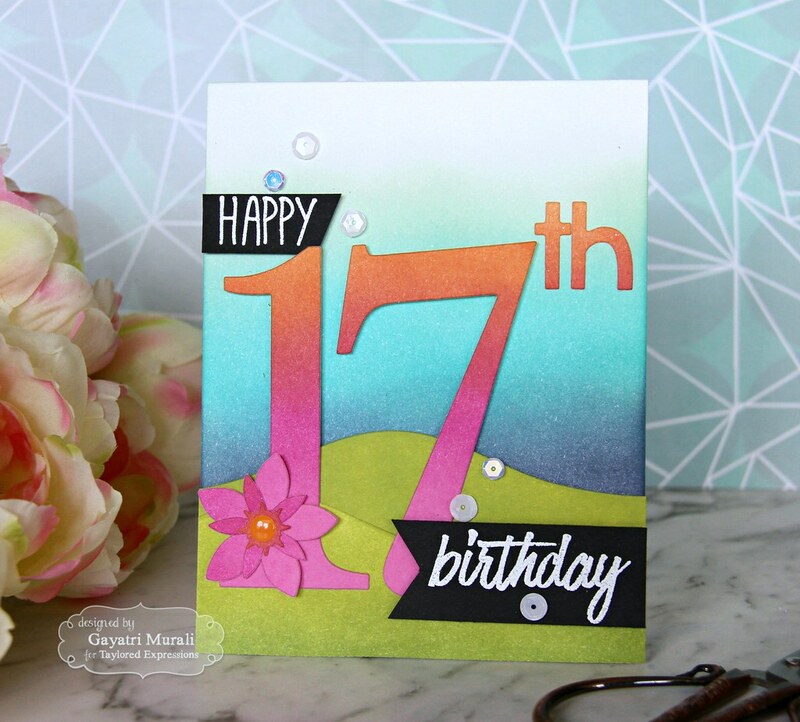 I created a background by sponging TE dye inks – Candy Corn, Lemon Meringue, Potato Chip, Mint Julep, Cookie Monster and Blue Corn. I love blending ink colours. TE dye inks are gorgeous and easy to colour. I started with light handed blending of inks. Then went back thrice to add more pigment and blend the colours. Initially the ink looks splotchy but in time when the ink dries, they even out and blend beautifully. I then stamped Cloud Nine background stamp on the top three fourth of the panel and left it to dry. I die cut the Little Bits: Owl using Toffee, Lemon Meringue, Oreo and Sugar Cube cardstock and assembled glued the pieces. The pieces I used as eye lashes are actually another set of eyes. So you get two set of eyes for the owl. 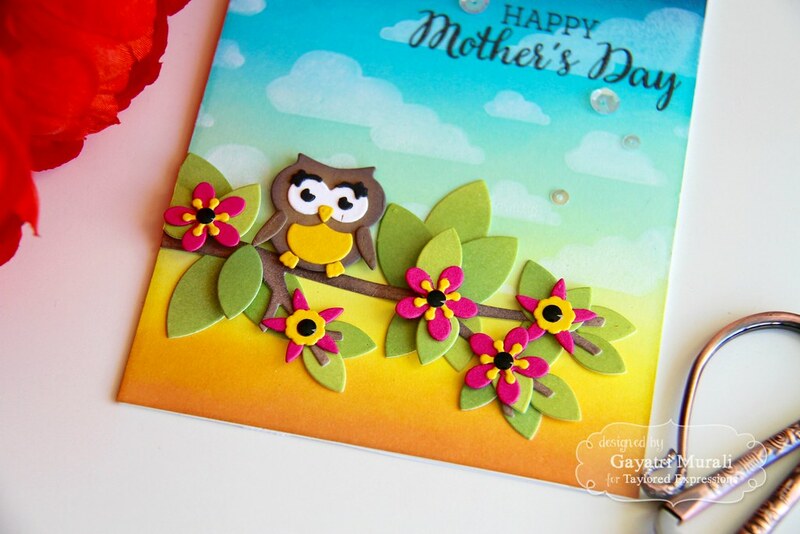 The On a Limb: Branch is die cut using sugar cube cardstock sponged with Chocolate Truffle TE dye ink. 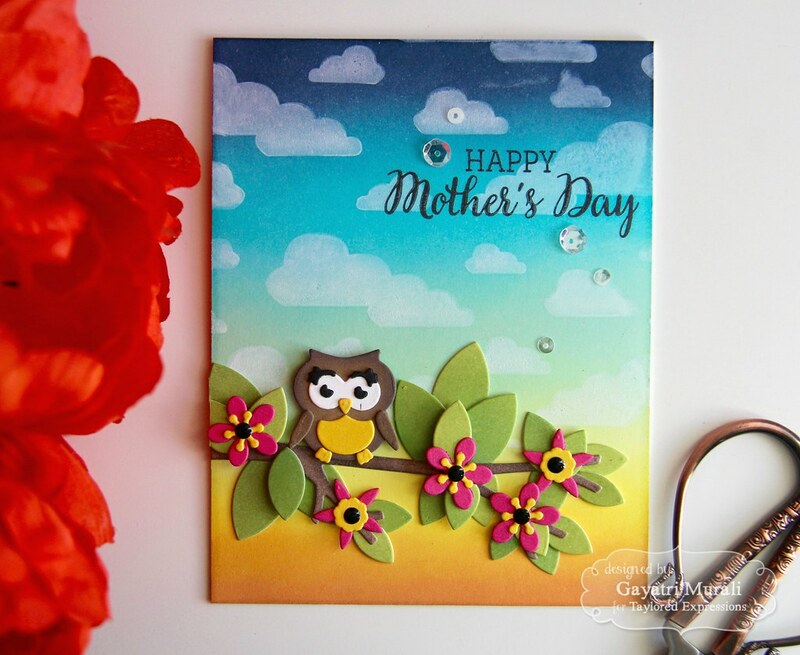 Similarly the leaves are die cut using Sugar Cube cardstock and sponged with Granny Smith and Peapod TE dye inks. The flowers are from the new Mini Bloomers 2 dies suing Lollipop and Lemon Meringue cardstock with TE Oreo enamel shapes at the centre. 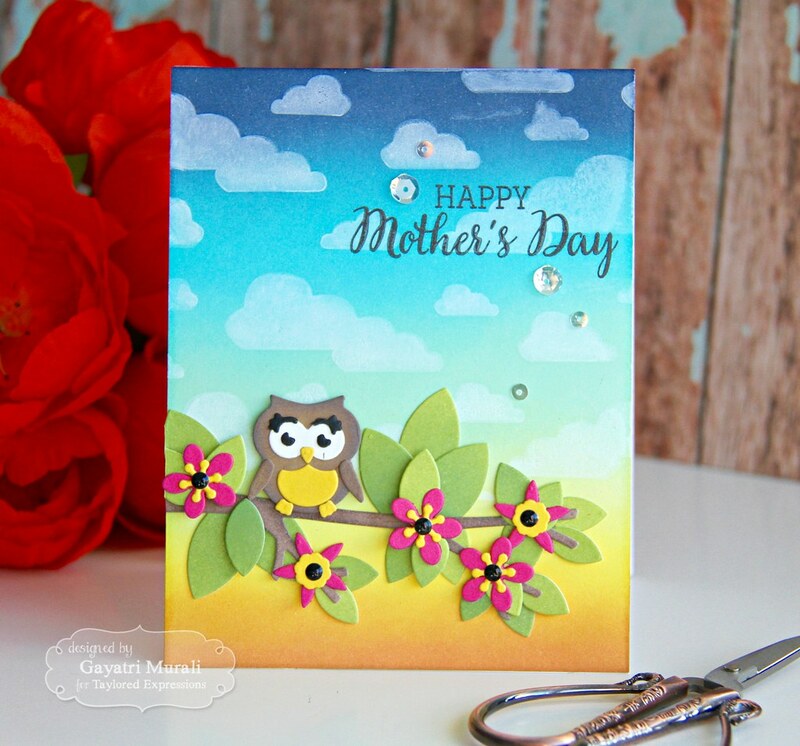 The sentiment is stamped directly on the panel from the Simply Said Mom stamp set using MISTI. I could not resist adding sequins from Snow Flurries collections. The second new product I am showcasing is numbers dies called Initially. 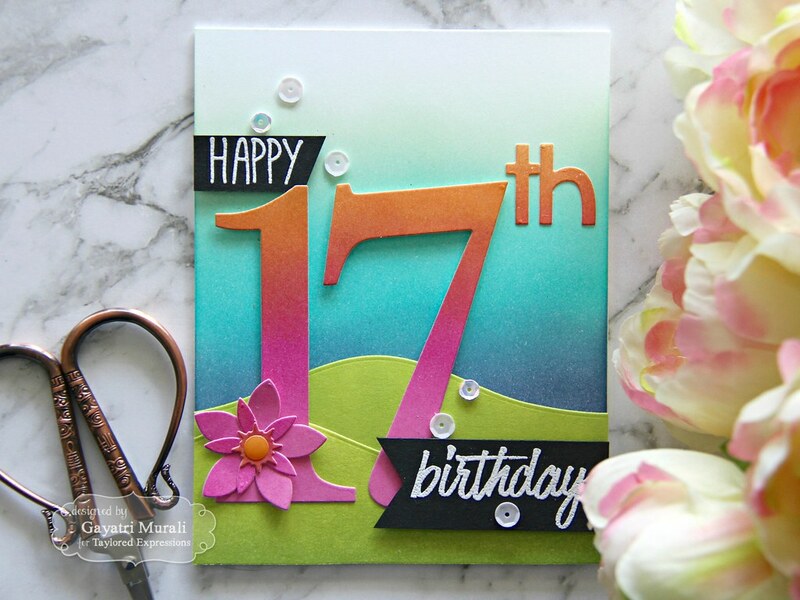 I have used Initially 1 and Initially 7 to make a birthday card. I am big on sponging and blending inks. So for this card to I did a lot of ink blending. I trimmed three sugar cube panel. On one panel, I sponged Candy Corn, Lollipop and Straberry Milkshake TE dye inks. The next I blended Granny Smith and Peapod TE dye inks and the last panel is my card front on which I blended Blue Corn, Cookie Monster and Mint Julep TE dye inks. I die cut Initially 1 and 7, the th from Sweet and Simple Alpha and Bloomers 5 dies using the pink and orange blended panel. 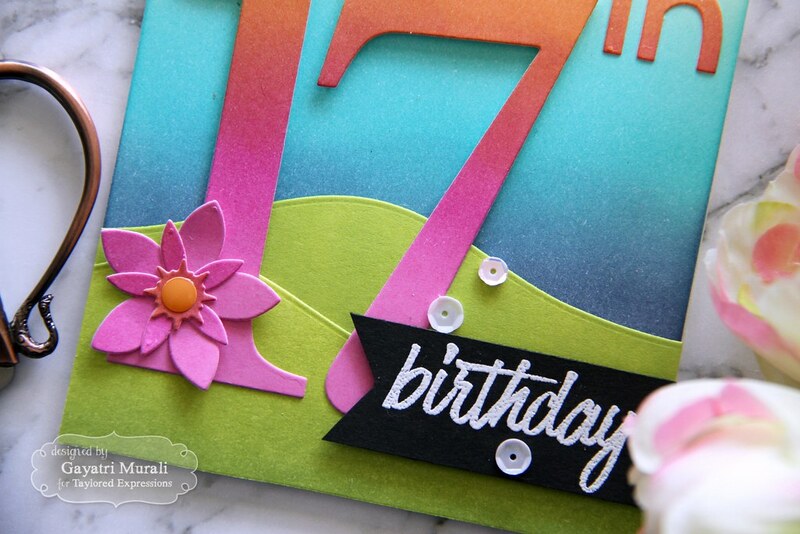 I die cut two landscape dies using Build a Scene Rolling Hills die and green panel. I adhered the two rolling hills die cut on the bottom of the blue ink blended panel. One glued flush to the panel the second using foam adhesives. I then adhered the numbers 1 & 7 and the “th” with the bloomers 5 flowers with TE Candy Corn enamel shape on the centre. Then I white heat embossed the sentiment from Best in the World stamp set on two strips of Oreo cardstock and adhered top and bottom of the card panel as shown. Finally embellished with sequins. Yes. more gorgeous sequins to complete my card. 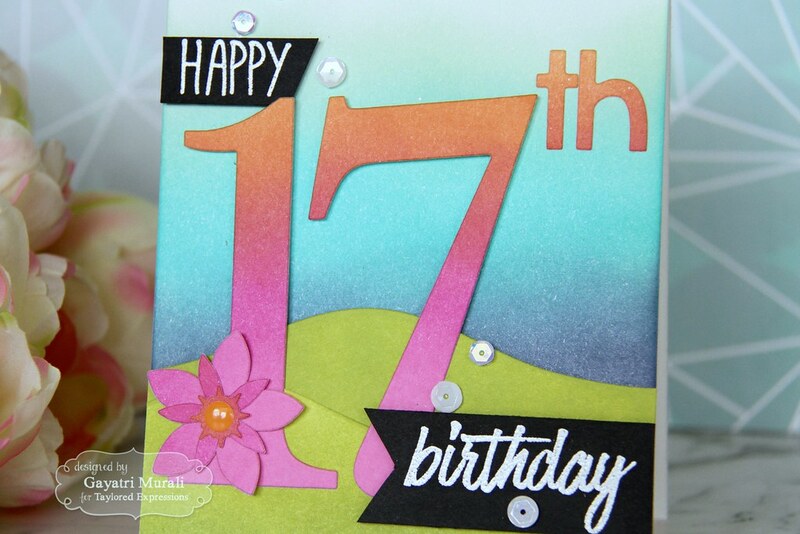 Here are some closeup of the card. Hope you like my project today. 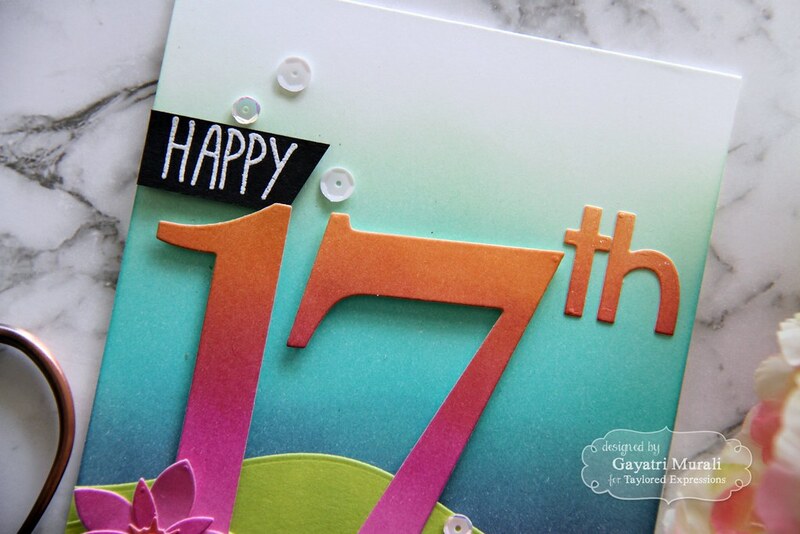 Check out Taylored Expressions Blog for more inspiration from Taylor and design team. Tomorrow is the release day and I will see then with more projects. Until then have a good day or evening where ever you are in the world.